The Gnateaters are plump, short-tailed, and long-legged bird of tangled forest undergrowth in South America. Ridgely & Greenfield (2001) say they "are elusive birds that occur in low densities." Indeed, back in 1986 when Peter Kaestner became the first birder to see a representative of every family in the world, these were his final family (Kaestner 1990; the list of families was somewhat different back then). I will have more on the story of this gnateater to follow, but first a few generalities about gnateaters as a group. There are just eight species of gnateaters, all in the genus Conopophaga. All are cute, round birds of the forest floor, and my sketch (above) doesn't really show the upright stance very well. Family status for the gnateaters has been controversial. Meyer de Schauensee (1970) considered them to be a subgroup of antbirds so during my early trips to South America I didn't even think of them as a family. Sick (1993) considered them distinctive but still just a subfamily of the antbirds. But Sibley & Ahlquist (1990) and Sibley & Monroe (1990), relying on DNA-DNA hybridization evidence, reinstated them as a family. They may be as related to tapaculos as to antbirds. The recent authorities have considered them a family (e.g., Ridgely & Tudor 1994, Ridgely & Greenfield 2001) and this will apparently be the position of the Handbook of the Birds of the World. In their small size (4.5 to 5.5 inches in length), long legs, and upright stance, gnateaters do resemble very small antpittas. Most species are sexually dimorphic and males are quite striking. In all but one case the species have a white postocular tuft; agitated birds may flare these tufts. This portion of a plate by Guy Tudor (right) shows six of the eight species. It is from Ridgely & Tudor (1986) and this scan is not nearly as dramatic as the printed plate. Every birder interested in world birding should have that outstanding book. The plate is part of a painting that includes various antpittas. The gnateaters shown are Chestnut-crowned C. castaneiceps (labeled "11"), Rufous C. lineata (12), Black-cheeked C. melanops (13), Ash-throated C. peruviana (14), Chestnut-belted C. aurita (15), and Black-bellied C. melanogaster (16). The only species not shown are Slaty C. ardesiaca and Hooded C. roberti. Ridgely & Tudor (1994) says that Rufous Gnateater can be locally common in undergrowth of humid forest where individuals or pairs perch close to the ground, and forage on the ground. They sometimes follow understory flocks. "Sedentary and not very shy", they say, "at times even approaching a quiet observer." Sick (1993) explains that the distinctive churring sound is made by a modified flight feather on the wing. As the male flies around its territory it makes a mechanical buzzing that it can turn on and off in an instant. Because of this wing buzz, produced only around dawn or dusk, it "becomes one of the most conspicuous crepuscular birds, whereas during the day it passes almost unnoticed." First one flies to Quito, the capitol of Ecuador, and then on to the riverside town of Coca. 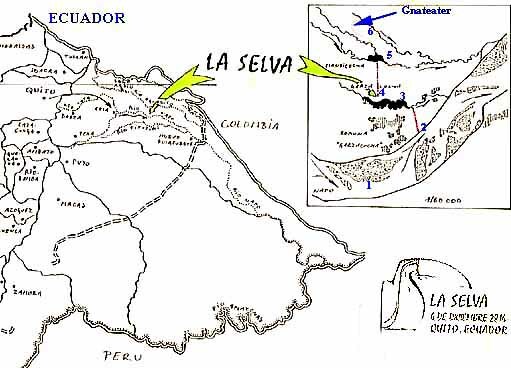 There the traveler is met by representatives of La Selva and transported two hours down the broad Napo River (blue #1 on the map above) by motorized launch to a landing. 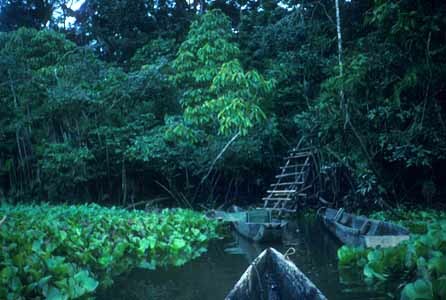 Here the guest walks a boardwalk (blue #2; top photo on this page) through riverine forest (porters carry the luggage) to a canoe landing on Garzacocha (blue #3), a large blackwater oxbow lake surrounded by jungle. One is paddled across the lake to La Selva Lode itself (blue #4; photo below left). The individual bungaloos are very pleasant and the food served in the group dining room is superb. Forest trails head mostly north; the broad main trail ends at Mandicocha (blue #5; photo below right), a smaller oxbow lake with many lily pads. 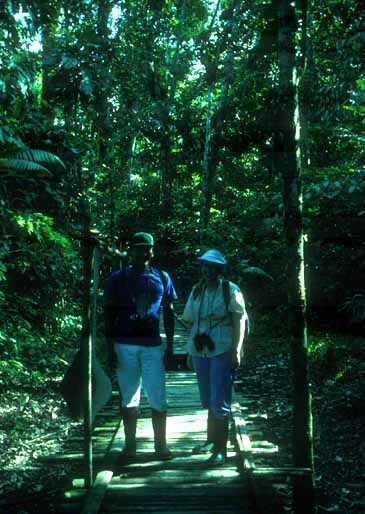 A birder can spend days on the main trail itself (and there is a canopy tower worth numerous visits) but the remote terra firma forest is on the other side of Mandicocha (blue #6). In looking back on those notes and sketch today, my impression is that the Paul Greenfield painting in Ridgely & Greenfield, which shows a richer chestnut-colored bird that the painting in Ridgely & Tudor (1994), better matches my field impressions. Rather little is known about the biology of gnateaters. They remain "elusive" birds indeed. UPDATE: Since this page was created back in 2001, my friends Kim Risen and Parker Backstrom visited Bolivia, and Kim Risen photographed this Slaty Gnateater (right). Thus I can now add a photo of an actual bird to this web page! It is quite an accomplishment to photograph any gnateater, given their secretive ways and dark undergrowth habitat. 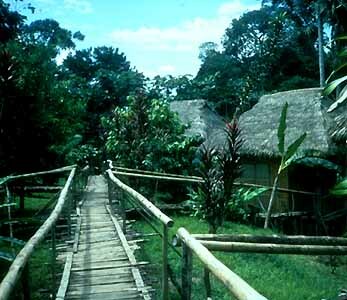 Photos: The photos of La Selva Lodge, Ecuador and vicinity were taken in April 1992. Guy Tudor painted the gnateater plate for the Birds of South America. Kim Risen photographed the Slaty Gnateater at Refugio Los Volcanoes, Bolivia, in Sep 2002. All photos are © 2001 Don Roberson except that of Mandicocha which is © 2001 Rita Carratello and the Slaty Gnateater © 2003 Kim Risen (used with permission); all rights reserved. Family Book: There is no "family book" per se but Ridgely & Tudor (1994) have a fine selection of species illustrated in color, and provide a good summary of the basics about this small family. Beyond that I certainly look forward to the Handbook of the Birds of the World chapter. Kaestner, P. 1990. Filling in the families. Birding 22: 34:37. Sibley, C. G., and Ahlquist. 1990. Distribution and Taxonomy of Birds of the World. Yale Univ. Press, New Haven, CT.